A few months back I posted on the particularities of bird photography. It seems to me a pretty utilitarian genre - concerned as it is with clarity and scientific definitiveness, but lacking that mysterious ingredient is necessary to be called "art." 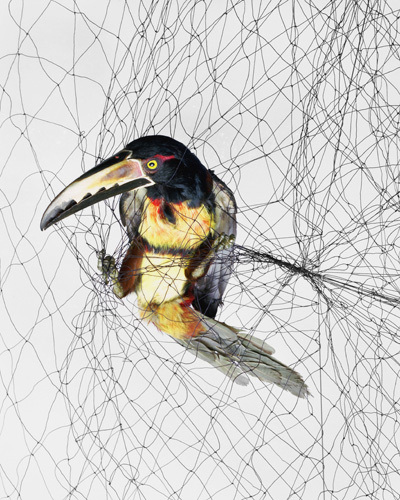 The only bird photographer I know of who I would consider a great artist is Todd Forsgren. In his most famous series, Forsgren photographs tropical birds temporarily tangled in mist nets. The images are striking, and the viewer can't help but calculate his empathy for the birds with the value of scientific data gained from their confinement. Perhaps most interesting to birders is the conceptual link between Forsgren's mist net images and the artwork of James J. Audubon, whose globally-influential paintings were built upon the sacrifice of thousands birds unfortunate enough to meet the business end of his shotgun. Todd was kind enough to let me talk with him over email about his idea on bird photography as art, how his series of photographs came about, and their reception. More of Todd Forsgren's images can be seen at his website and via Heiner Contemporary. Birdist: Which started first for you: birding or photography? Forsgren: I was definitely a birder long before I was a photographer. I started birding early, maybe 4th or 5th grade. I was a total bird nerd in high school, heading out on VENT bird camps in Arizona and competing in birdathons for the ABA's Tropicbirds youth birding team. When I first went off to college, I thought it would be to become an ornithologist, and I do have a degree in biology. It wasn't until my junior or senior year at school that I started taking cameras seriously. Within a few years after school, I decided that's what I wanted to do with my life: make pictures. Photographing birds was just a matter of time. Birdist: So you didn't start with photographing birds right away? What kinds of photography did you start with, and which photographers do you admire? Birdist: Yeah I'd love to talk about the twisting of nature and documentary photography. That's the impetus for me speaking with you, actually. I did a post not long ago about what I see as a lack of imagination in birding photography - dominated as you point out by centered close-ups taken with expensive and, yes, phallic lenses. Your mist net photos were one of the few examples I knew of photography that elevated birding beyond simply making the ID. When you were in that period of knowing you wanted to talk about birds but not knowing how, what was the debate you were having? Forsgren: You know, just before heading down to Mexico I picked up my first of those expensive and long lenses. The idea was to play around with it while I was in the jungle waiting for other birds to fly into the mist nets. I must say, it definitely gave me a new respect for that genre of wildlife photography. It requires such a large amount of patience and, what I would call, photographic athleticism... You really need to know how to use your camera to get those photos right! Though I have a system down in terms of photographing birds in mist nets, I still need to work on my on my skills in terms of wildlife photography in general. And I think it has an important role in terms of conservation and documentation. As well as that joy of identification and classification. In terms of my own journey and trials in finding a method to photograph birds, I don't know if I was having a debate. It was in the back of my mind somewhere, that I wanted to take pictures of them. I was in a very conceptual art school at the time (School of the Museum of Fine Arts, in Boston) where I would've gotten ripped apart if I showed up at a critique with the more typical style of wildlife photography. One morning I was jogging along the Charles River and I saw a Black-crowned Night-heron that had strangled itself on a barb wire fence, and found it beautiful and captivating and tragic. And then I thought of Audubon. And by the time I made it back from my run, I had basically formulated how I wanted to photographic birds, minus a few technical tricks that I've learned along the way. Birdist: Can you articulate why traditional bird photos would have been torn apart in art school? What is the ingredient that differentiates birding photos from art? Forsgren: I'm not really one to construct hierarchies when it comes to calling one type of photograph 'art' and another 'not art.' If Duchamp can call a toilet art, then certainly we should have a more broad idea of what it is and how it can function than a narrow one. I do consider 'birding photos' art, and they do interest me in a number of ways. That said, I do make different value judgements based on how and why a photograph/photographer interests me. The critical debate going on at academic institutions like the SMFA puts a very high priority on innovation... My peers would've told me to show them something new. For me, looking at more traditional bird photography is a wonderfully hedonistic experience of appreciating and being in awe of nature, and I think there are plenty of 'new' things to show in approaching photography that way. But with my ornithological photos, I'm trying to tangle the viewer as much as the birds are tangled. Birdist: So how did you get from the tangled night-heron lightbulb moment to your mist net photos? Once you knew what you wanted to do, how did you go about doing it? Forsgren: It's always difficult for me to explain or quantify those 'eureka!' moments of life. If I understood them better, or what led to them, I think I might have such moments more often. I suppose it was a series of quick little lightning bolt like flashes through a lot of the bird art I'd liked growing up crashing against the influences that were having more of a draw on me in art school. It was actually kind of a messy morning: I had just realized that a relationship I was involved in was coming to a crashing end and I had a mild hangover. I was about to move out of the city and I was feeling incredibly lost. But somehow, my mind was on overdrive, and those thoughts started to fit together. The good news about doing typographic work like this is that the one eureka moment has led to several years of productive photography. I started out by contacting a few friends who were working with birds. They let me come out and take a few photos. After a few other distractions, like a diversion to Mongolia to photograph vegetable gardens and going to graduate school and working on more studio based practice, the project has gained its own momentum from there. Birdist: Are the photos taken in the field? Are they on mist net jobs you're working on anyway? Forsgren: Yes, the photos are taken in the field. I bring along a portable photo studio that I can set up at a moment's notice. I'm always working alongside biologists... 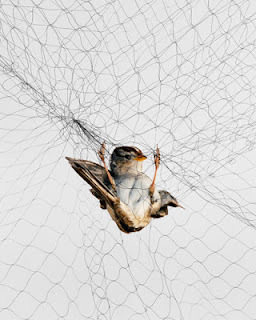 Although my photographs often focus on the by-catch that flies into the nets as well as their study species. Birdist: Some articles about your work describe it as "controversial" or that it "ruffles feathers" (their 'hilarious' pun intended). What's been the response to your work? Has it surprised you in any way, or is a certain initial distaste for the images part of the process? Forsgren: Ultimately, no. I don't mean for the work to be controversial. I hope that in the end, the viewer agrees with my taking the photographs as an interesting document of a unique moment. But controversy is a small part of the experience I hope viewers have when they look at the work, a sort of initial response. There's a vocal group that doesn't like mist-netting/bird banding at all. They obviously don't like these photos one bit either, except for appropriating them as propaganda against mist-netting. A few others have criticized my work in a more nuanced way, saying that they think it's acceptable for biologists to work with birds, but that they're not sure if it's acceptable for me to delay this process for art's sake. That's perhaps closer to the questioning and reasoning I hope people go through when they approach the photographs. I'm certainly not trying to make images that are easy or simple to digest and consume. That is in part because I find some elements of the "consumption of nature" quite... problematic. People experience the work differently depending on what they know about the process. For folks who don't know about mist-netting at all, the initial thought is that I'm photographing an environmental tragedy. If they take the time to read my statement, they start to see a bit of the art history behind the images, as well as how it relates to contemporary science. Through this process of understanding, I suppose I hope that they might have an experience that starts with revulsion and moves to acceptance and ends with appreciating the beauty of this unique moment and opportunity. As a total bird nut, I've always found the precious opportunity to work with wild birds is magically. Every time I band birds, I'm in awe. But I think most people who care about birds are, like me, also a bit conflicted about it. Ultimately, we come to the conclusion that the research being done is important. That the tax and stress on a few individuals gains valuable data that helps us understand the populations and better manage and conserve these species. Ultimately, our respect for these individual birds that we're lucky enough to come in contact with is derived from deep care for them. I hope that in part, my work is a provocative education tool to this end; a complicated look at how we appreciate wildlife. I feel lucky and honored that so many biologists have agreed with me enough that they have been willing to let me join them in the field and photograph the birds they work with.